Three years ago the work was started in reproducing in detail in the grounds of the Mines Rescue station, Manners Road, Ilkeston - the conditions existing at an actual pit so that local colliery rescue teams could receive far more efficient training than has been possible in the past. Underground tunnels, about 400 feet of them, have been dug out a few feet below the surface of the Station premises. Pit-props, a conveyor belt, tub-tracks and even a coal cutter have been installed to bring true-to-life conditions as experienced by miners every day. class training at this unusual school where the tunnel ceilings are so low - another life- like feature is that a pupil bangs his head if he forgets to keep it well down during "lessons." Members of the volunteer teams from these 32 collieries are taught actual rescue work, fire fighting and procedures in case of explosion, in fact their schooling covers every eventuality of the dreaded underground disaster. And their teachers? - these are the men who have learned much of what they know in the hard school of experience. Most of the instructional work is carried out by Mr.A. Syson, superintendent of the station, and Mr. A. Sheffield; assistant superintendent. The whole project was in fact Mr. Syson's idea and was given the blessing of the N.C.B. The cost of the scheme has been reduced by the fact that the 12 members of the Station staff have carried out all the work themselves - building the tunnels, putting up supports and even brushing black paint on to an underground wall which represents the coal face. All this has, of course, been apart from their own actual rescue work, visiting collieries to train rescue teams, and, one of the most important jobs of all, careful attention to their equipment,a slight fault in which might cost them, or the me they are rescuing, their lives. Mr. Syson, who has been superintendent at the Station since 1936 he says that their underground school has cost only a few hundred pounds. It will obviously more than repay for itself in improved mines-rescue efficiency. For several years before the Station's "pit", was opened, training was carried out in a small brick construction, representing a colliery road-way, at Manners road. Mr Sheffield, who has been at the station for nearly 18 years accompanied me, being bent nearly double all the way, made our way by the light of our lamps, through the miniature colliery. Even though the work has not been completed it was easy to believe this was a real pit. To illustrate the point - Mr Sheffield was just showing me the coal face" when I heard a loud and ominous rumbling noise. Momentarily I must have looked as scared as I felt. "No, it's only a thunder storm outside," he assured me! Here and there were lying "bodies" - life size wooden dummies of men, representing casualties. These, too, have been made by the station staff and are used during training. 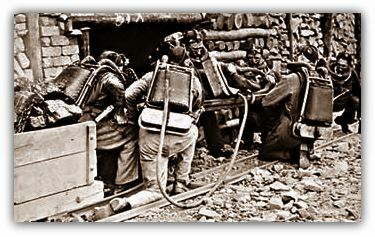 It is obviously no easy task for the rescue teams, weighed down as they are by their heavy equipment, to carry these dummies through the narrow tunnels. But their task is often deliberately made more difficult by the trainers, for a 5 h.p. fan has been set up in one section of the working to blow thick eye-stinging smoke and fumes from the boiler house into the tunnels, giving trainees experience in working in conditions that would exists if say an underground fire had broken out. Incidentally, till I visited the station I had always regarded the use of canaries in the detection of gases in collieries as a cruel necessity. Mr.-Sheffield soon changed that point of view. He told me that not one of the Station's canaries had died by gassing, since he had been there although many had been used for gas detection work. "When you are going down a pit where there might be gases you have to keep a close watch on the canary you are carrying," he said. "The first sign gas is that the bird starts blinking rather sleepily. Then it starts wobbling and eventually drops to the bottom of the cage with it's wings outstretched." To revive it the canary is given the same treatment that men receive in similar circumstances. The bird is taken away from the danger area, given oxygen from the rescuers supply and has its breast massaged as a form of artificial respiration. This soon brings it round. The stations 26 canaries certainly looked chirpy enough when I saw them in their aviary where they are bred and where they receive the best of treatment - treatment merited by these little life savers.